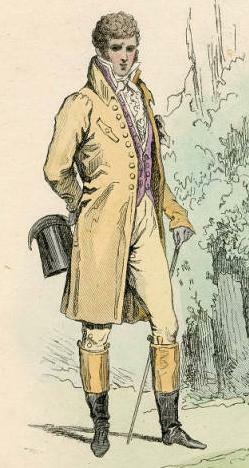 In this caricature, you can see a contemporary rendering of short, loose trousers; formal breeches; and a form-fitting pantaloon. By the turn of the 19th century, breeches, pantaloons and trousers worn by all men were sewn with a flap in front called a fall front. This flap was universally held in place by two or three buttons at the top. No belts were worn. Instead, breeches, pantaloons and trousers were held up by tight-fitting waists, which were adjusted by gusset ties in back of the waist. Seats were baggy to allow a man to rise comfortably from a sitting position. As waists rose to the belly button after 1810, suspenders were used to hold the garment up. Breeches silk – 18th century – part of a wedding suit. From the Ham House collection, Surrey. 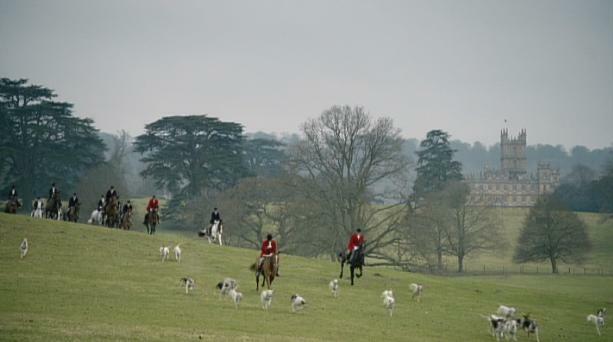 Image @National Trust. Note that the front flap has only two buttons. 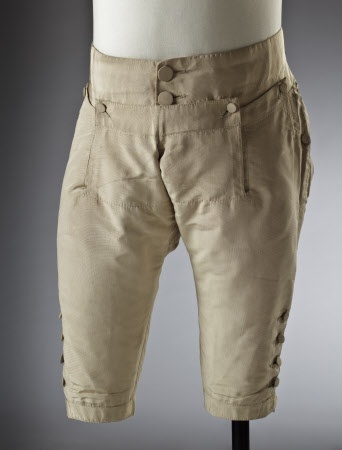 Breeches, or short pants worn just below the knee, were popular during the 18th century. During the Regency era, they were worn largely as evening wear or at court, a practice that was to continue until the mid-century. By the 1820s, breeches had fallen out of favor for day wear and were considered either too old-fashioned or effeminate a garment. 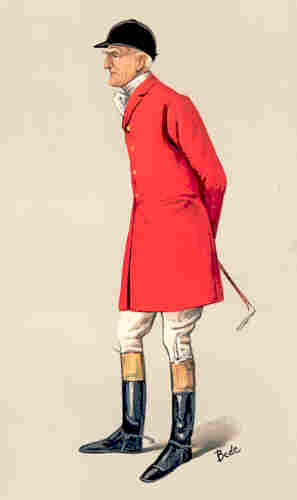 As the 19th century progressed only liveried male servants, most specifically footmen, continued to wear breeches. 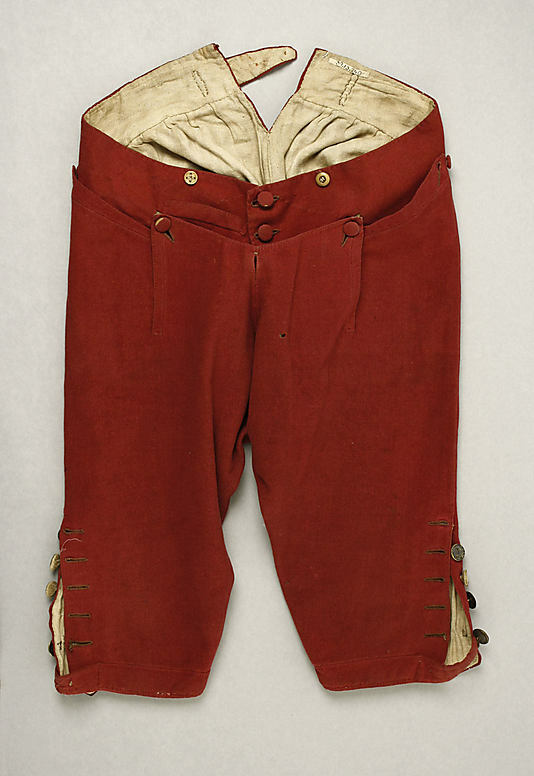 In their heyday, breeches were made from a variety of materials. For the upper classes, buckskin breeches were considered to be proper casual attire for mornings or life in the country. 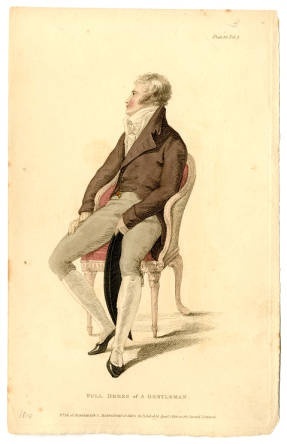 Silk breeches were reserved for the evening and more formal occasions. White stockings were worn with white breeches, and black or white stockings with black breeches. 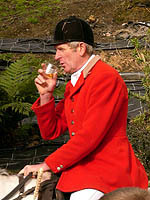 Tradesmen and hunters wore breeches made of leather or coarse cloth. Country or morning attire of buckskin breeches, clawhammer coat, and riding boots. 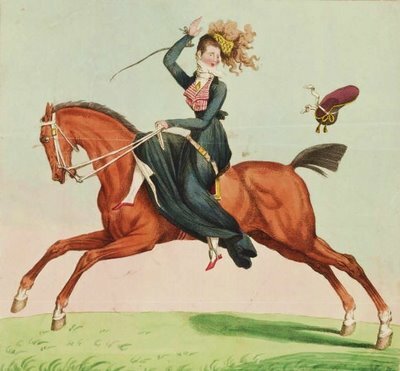 Around the 1790s, the tail coat changed and breeches began to be lengthened below the knees to accommodate the longer tails, gradually giving way to slimmer fitting, longer pants, or pantaloons, that ended at the ankle. Pantaloons were close-fitting and sometimes buttoned all the way down the leg. Fabrics were knitted or, like kerseymere and nankin, cut on the bias, so that the garment would hug the leg. 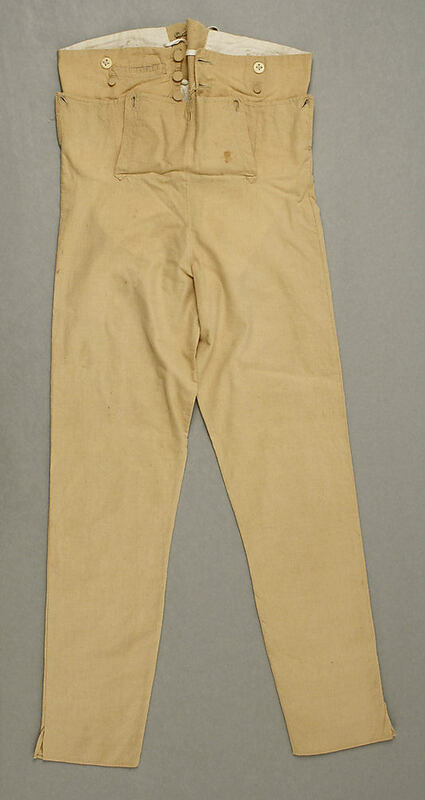 These slim pants were often worn with Hessian boots. 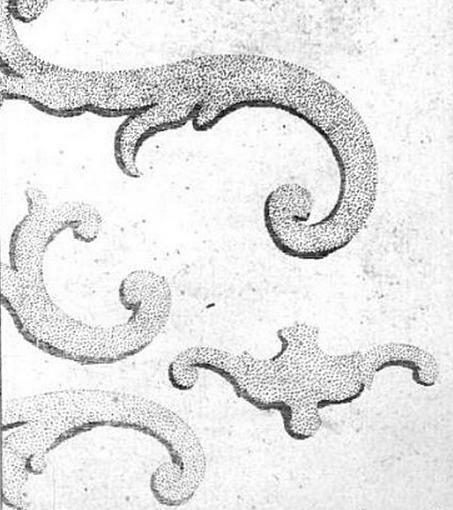 To help maintain a smooth look, some pantaloons had a fabric loop that went under the foot, as in the image below. Gusset ties are evident in this image. Pantaloons were recommended for men whose legs were both slim and muscular. The idea was to show off a good leg. If men possessed deficiencies in musculature, a slight degree of stuffing was recommended, although padding, it was assumed, would be used with the greatest care and circumspection. Interestingly, stockings worn under pantaloons were kept in place by the tightness of the design and fabric. Some dandies added padding to attain the ideal 1819 male figure. 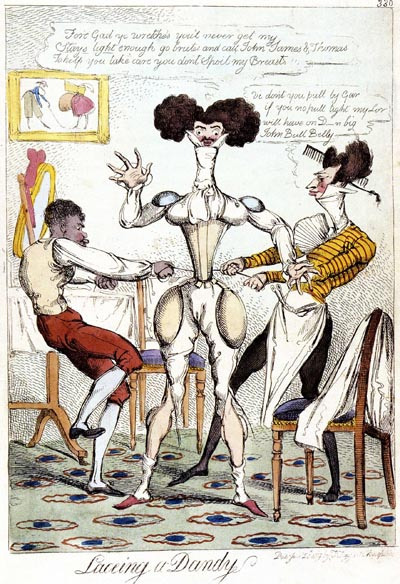 Caricaturists had a field day with men whose physiques looked outlandish in pantaloons. 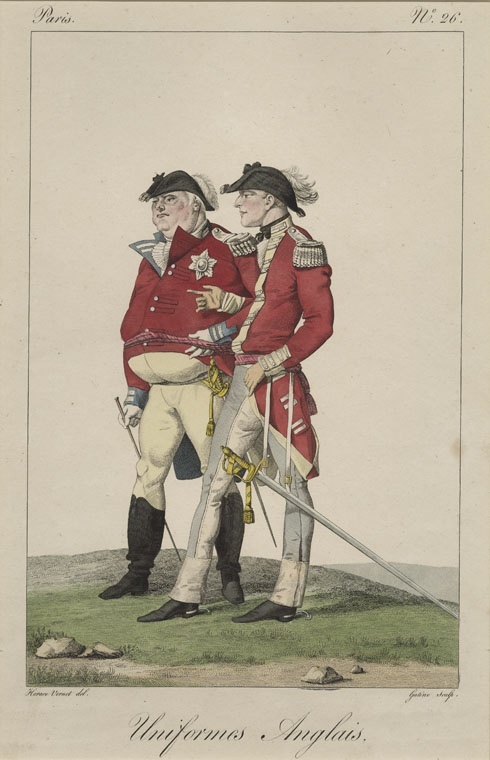 French illustration of British gentlemen. Note the unflattering way that pantaloons hug the figure on the left. This detail of a public domain image from the Metropolitan Museum of Art shows a Regency dandy who cuts a fine figure in his pantaloons. No stuffing or corsets needed here. Overalls were a form of extended breeches used largely by military men, but first worn by men in the American frontier. They covered the leg, stockings, and buttoned over shoes, much like spats. They were a practically garment for traveling and walking over rugged terrain, and were quickly adopted by the British army. 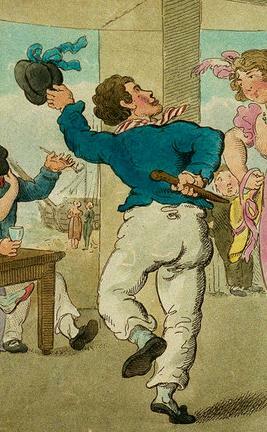 Trousers were first worn by sailors and working men before 1800, and were adopted by the fashionable set around 1810. 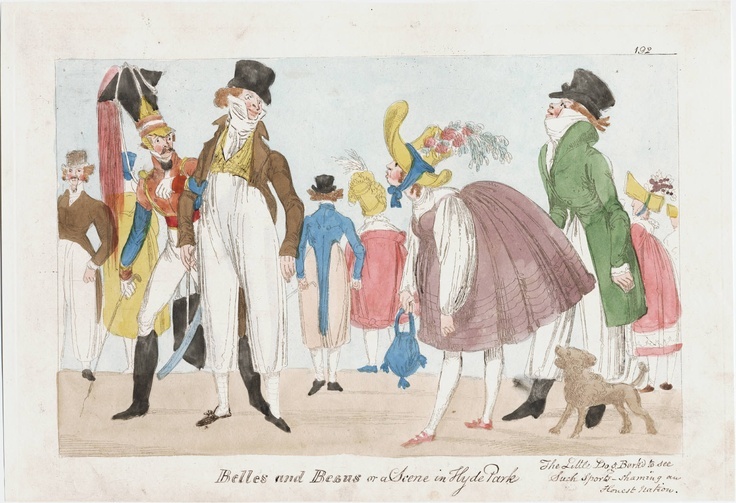 Scene in Hyde Park in 1817 shows a combination of trousers and pantaloon worn by the soldier. 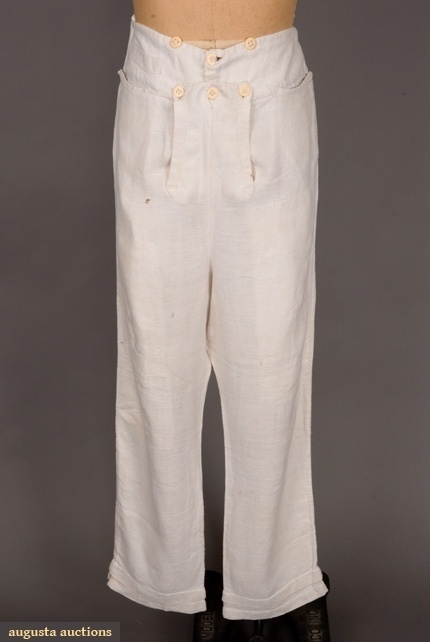 Originally known as “slops”, trousers were loose-fitting and ended at the ankle. As trousers were adopted, long stockings with decorative clocks were replaced by half-hose, all but destroying the stocking industry, which had thrived since breeches had become fashionable. 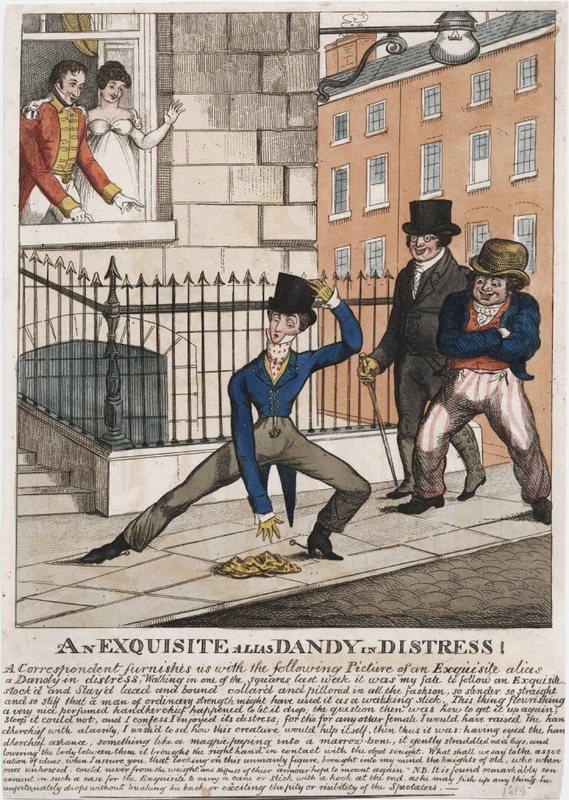 Caricatures had a field day showing dandy’s in short wide-legged trousers, as in the image below. An exquisite wearing wide legged trousers with a high waist that came up to the navel. Closer fitting trousers were slit up the seam for a few inches above the ankle. This allowed the foot to get through the pant leg. 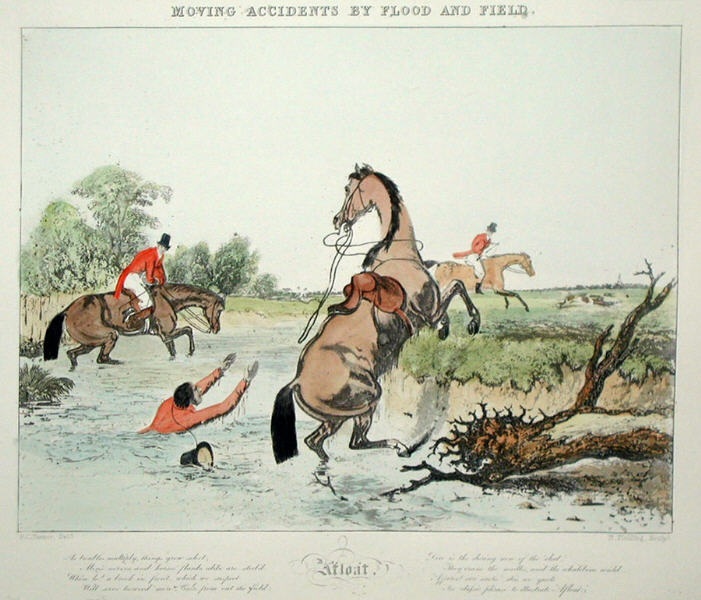 (Breeches and pantaloons were buttoned on the side.) 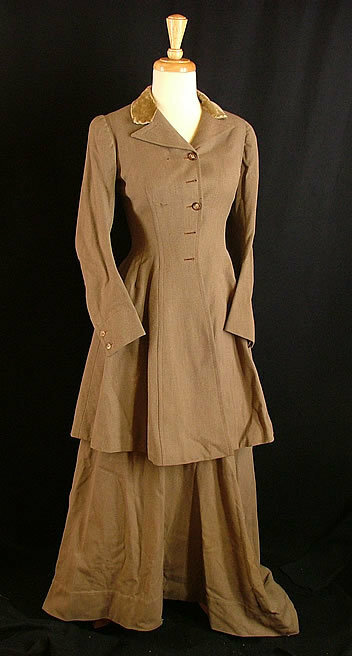 Early in the 19th century, they were appropriate only for day wear. 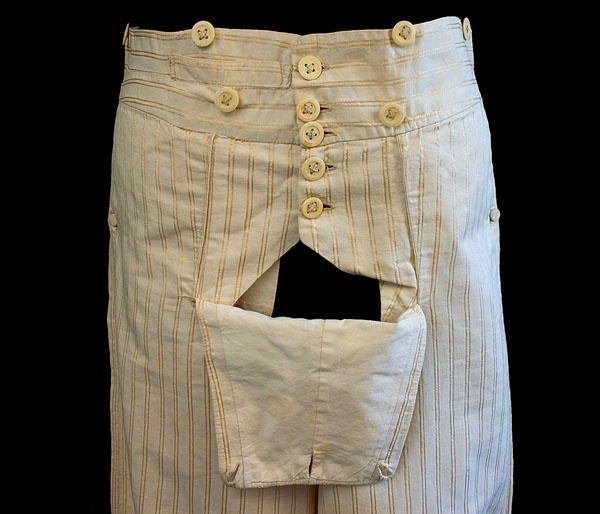 cotton trousers from 1800, Image @Met Museum, with slits up the seams. 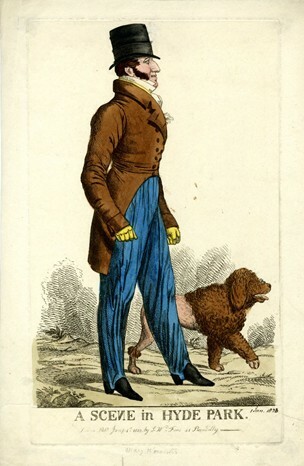 Tight trousers create a dilemma for this dandy, who cannot pick up his handkerchief. Notice the very high waist. Trousers were made of wool, linen or cotton. They could also be strapped. 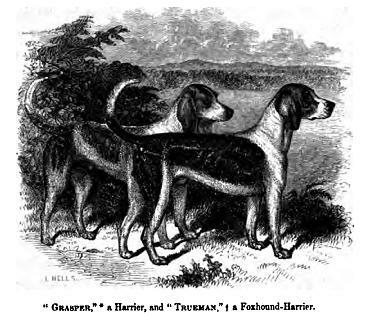 By the 1840s, they had replaced pantaloons. The waist is high in the above trousers, which were probably kept up with suspenders. The well trousered gentleman, ca. 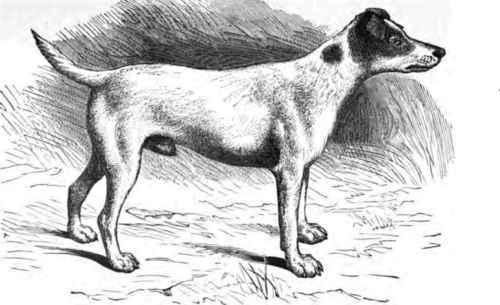 1830s-40s. Knee pants with black silk stockings were an essential evening accessory until 1850s when long trousers finally took over. Up until the 1850s, the tie could be black or white, but by the ’60s, white or off-white was the most common choice. 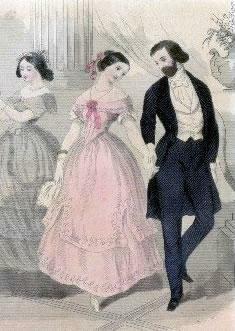 In the 1850s long trousers finally replaced breeches for appropriate evening attire. 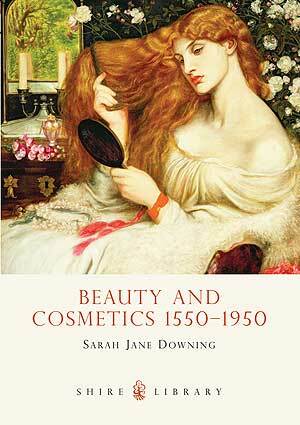 Beauty and Cosmetics 1550-1950 by Sarah Jane Downing was published this month by Shire Library. Small and compact, as Shire publications tend to be, this wonderfully illustrated book describes the standards of beauty popular in each era, from 1550 when alabaster brows were highly prized, to the black eyebrows that were favored by 18th century women. 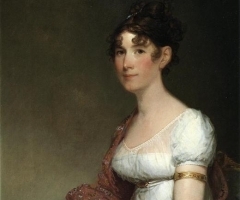 As with her best-selling Fashion in the Time of Jane Austen, Ms. Downing provides the reader with a comprehensive overview of the topic. She begins with the Tudor Court and ends with the delightful cosmetic advertisements of the first half of the 20th century. 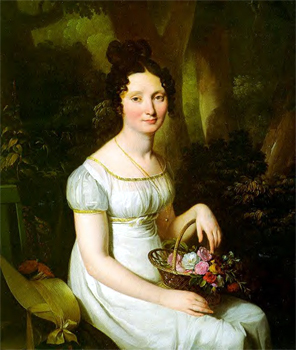 Because my blog’s theme centers on the Georgian and Regency eras, I will confine much of my recap to those years. Mirrors, once only possessed by the rich, became so popular in London in the mid-16th century that British manufacturers petitioned Parliament to ban foreign imports. The ritual of the dressing table became quite elaborate and ladies began to entertain guests as they prepared themselves for the day. Decorative patches covered skin blemishes and blotches, sometimes to such an extent that a face could be covered with a variety of dots, half-moon crescents, stars and even a coach and horses! 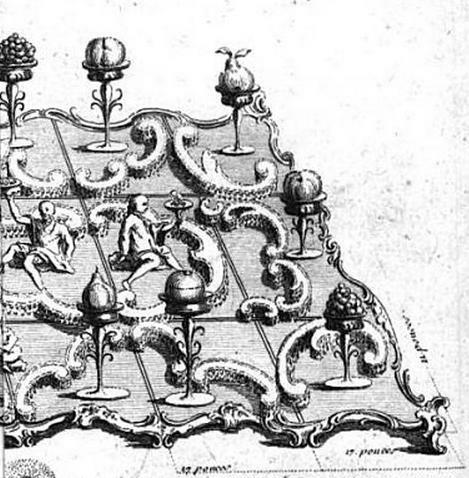 The popularity of using patches began in the mid-17th century and did not wane until the end of the 18th century. 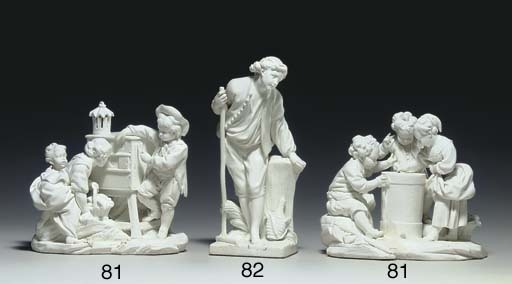 Porcelain skin was highly prized and created with white lead-based skin cream. Blush was then applied to create a doll-like look. Cosmetics were created in a variety of ways. Here are the ingredients for one recipe for lead face powder that did not come from this book: several thin plates of lead, a big pot of vinegar, a bed of horse manure, water, perfume & tinting agent. Once can only guess how this concoction was put together and at its smell. Marquise the Pompadour applying face powder with a brush. 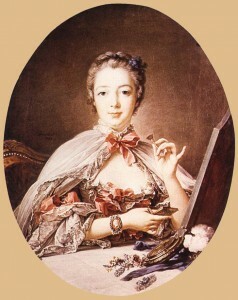 Boucher, 1758. 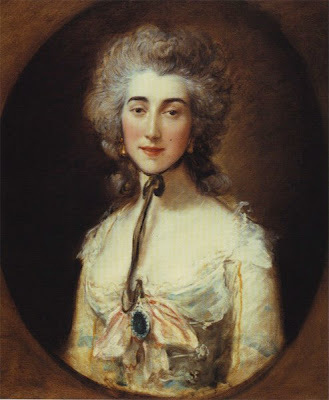 Gainsboroughs portrait of Grace Dalrymple Elliot in 1782 shows the craze for dark eyebrows. Aging beauties staved off the ravages of time with sponge fillers and rouge (sound familiar? ), while many women risked poisonous side effects from using their deadly cosmetics. 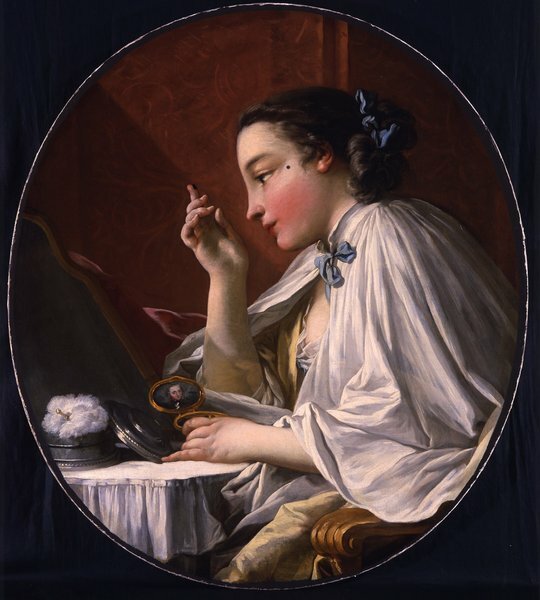 Maria, one of the Gunning sisters who went on to become Lady Coventry, was so addicted to her lead-based paints that she died in 1760 at the age of 27 knowing full well that she was at risk. 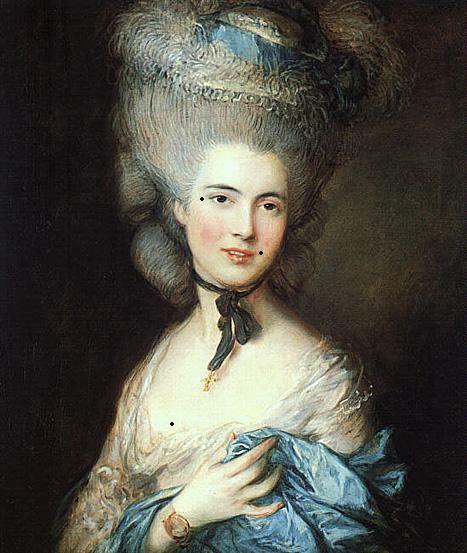 The French Revolution swept away the widespread use of makeup, which was associated with the aristocracy. Defiantly, some aristocratic ladies went to their doom wearing a full complement of make-up: pale skin, patches, rouged cheeks and rosy lips. The more natural look of the regency woman. Note that the cheeks are still rouged. 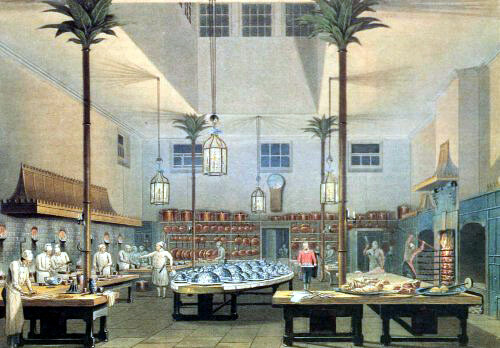 Rousseau influenced the concept of nature and a more natural Romantic look took hold, aided by the blockade of cosmetics during the Napoleonic Wars. The death of many soldiers resulted in widespread melancholia and the affectation of a consumptive look. Ladies, nevertheless, were never far from their rouge pot. Another Regency portrait with subtle makeup. The flower basket adds to the natural look. 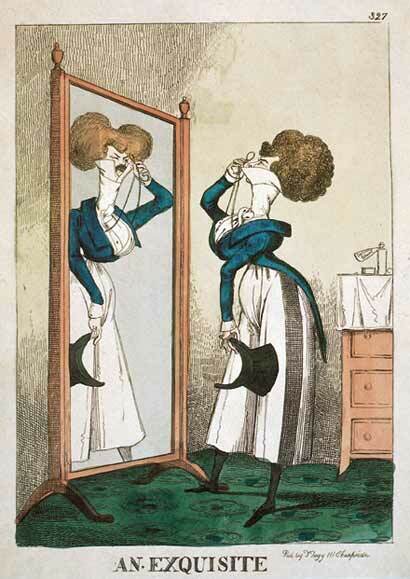 As with all Shire books, Sarah Jane Downing’s trip through time provides us with brilliant insights, in this instance it is via cosmetics and how society viewed beauty in each era. By the 1950s, the success of a marriage was defined by how well a woman took care of herself. This included makeup. Beauty, as Ms. Downing wrote, “was switched from a pleasure to an obligation.” Oh, my. 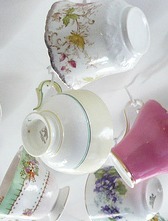 I give the delightful Beauty and Cosmetics 1550-1950 four out of five Regency tea cups. This Sunday, PBS will air on most stations an hour presentation of Secrets of the Manor House, a documentary narrated by Samuel West, that explains how society was transformed in the years leading up to World War One. 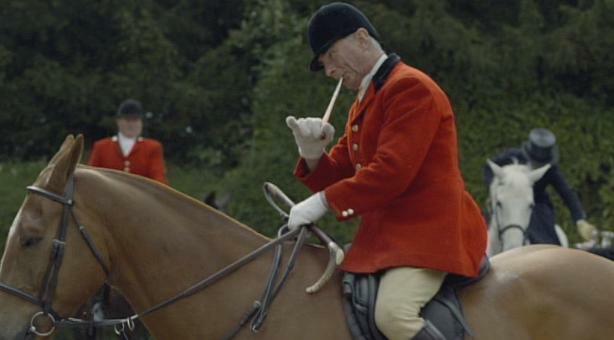 Expert historians, such as Lawrence James and Dr. Elisabeth Kehoe, discuss what life was like in these houses, explain the hierarchy of the British establishment, and provide historical and social context for viewers. 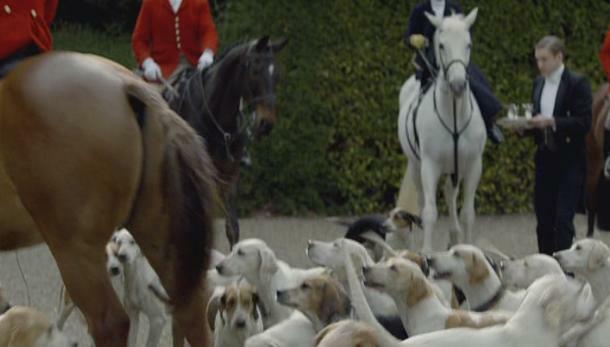 For American viewers of Downton Abbey, this special couldn’t have come at a better time. The British manor house represented a world of privilege, grace, dignity and power. For their services for the King in war, soldiers were awarded lands and titles. The aristocracy rose from a warrior class. This world was inhabited by an elite class of people who were descended from a line of professional fighting men, whose titles and land were bestowed on them by a grateful king. 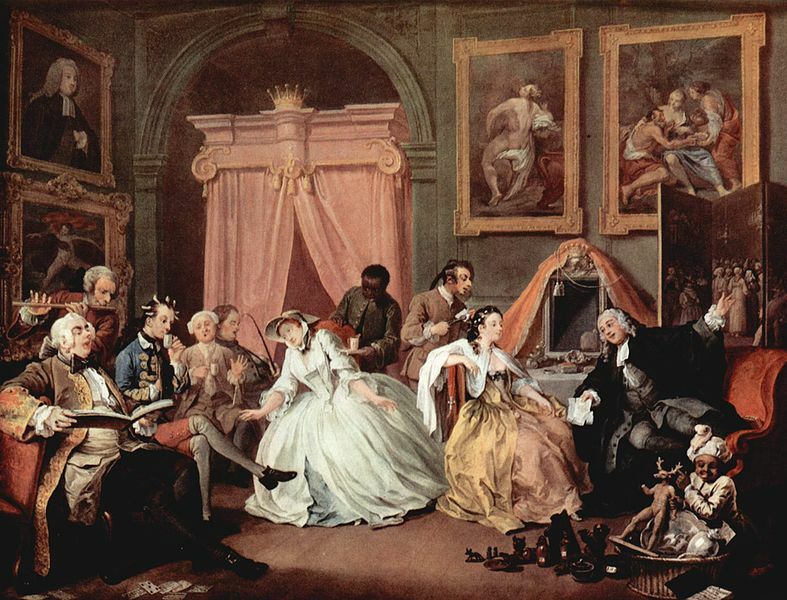 For over a thousand years, aristocrats viewed themselves as a race apart, their power and wealth predicated on titles, landed wealth, and political standing. Huge tracts of lands with fields, villages, laborers' cottages, and forests surrounded country estates. Vast landed estates were their domain, where a strict hierarchy of class was followed above stairs as well as below it. In 1912, 1 ½ million servants tended to the needs of their masters. As many as 100 would be employed as butler, housekeeper, house maids, kitchen maids, footmen, valets, cooks, grooms, chauffeurs, forestry men, and agricultural workers. 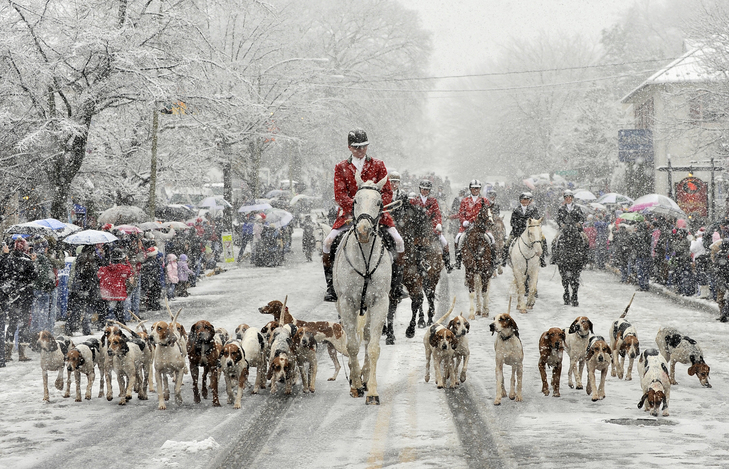 Tradition kept everyone in line, and deference and obedience to your betters were expected (and given). 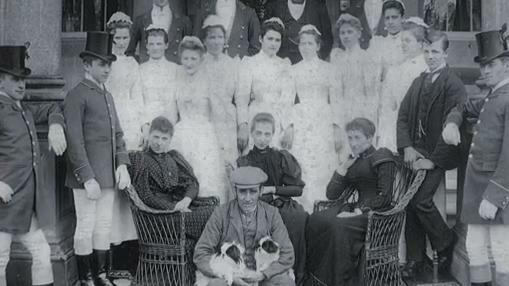 22 staff were required to run Manderston House, which employed 100 servants, many of whom worked in the gardens, fields, and forests. As a new century began, the divide between rich and poor was tremendous. While the rich threw more extravagant parties and lived lavish lives, the poor were doomed to live lives of servitude and hard work. Lord Palmer pulls on a false bookcase to open a passage to the next room. Manderston House in Berwickshire represents the excesses of its time. The great house consists of 109 rooms, and employed 98 servants just before the outbreak of World War One. 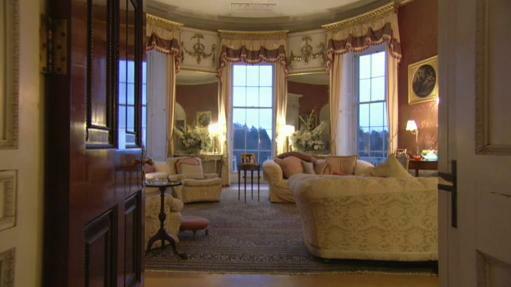 Twenty two servants worked inside the house to tend to Lord Palmer and his family. Every room inside the house interconnected. The curtains in the ballroom of Manderston House look as fresh as the year they were made in 1904. 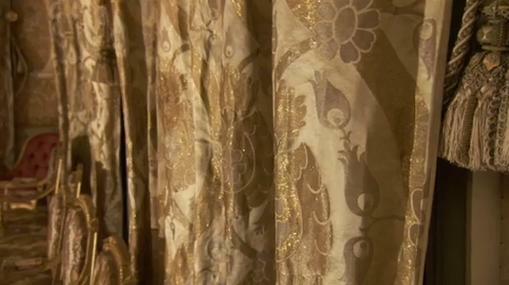 The curtains and drapes, woven with gold and silver thread, were made in Paris in 1904 and cost the equivalent of 1.5 million dollars. Manderston House itself was renovated at the turn of the century for 20 million dollars in today’s money. This was during an era when scullery maids earned the equivalent of $50 per year. Once can clearly see the differences in bell sizes in this photo. 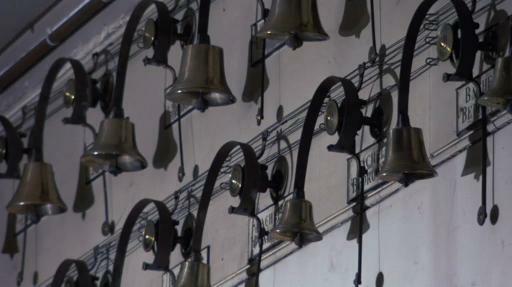 The servant hall boasted 56 bells, each of a different size that produced a unique ring tone. Servants were expected to memorize the sound for the areas that were under their responsibility. Scullery maids were placed at the bottom of the servant hierarchy. They rose before dawn to start the kitchen fires and put water on to boil. Their job was to scrub the pots, pans and dishes, and floors, and even wait on other servants. Life was not a bed of roses for the working class and the gulf between the rich and poor could not have been wider than during the turn of the 21st century. 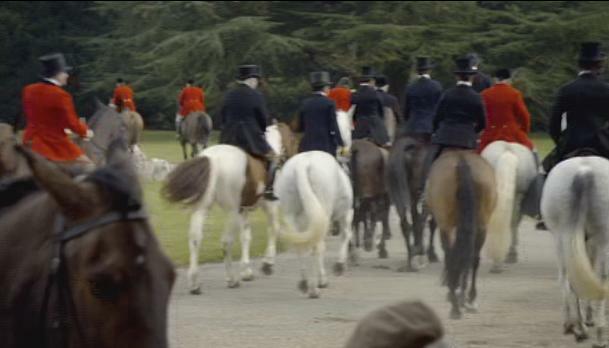 Thoroughbred horses lived better than the working classes. While the servants slept in the attic or basement, thoroughbred horses were housed in expensively designed stable blocks. 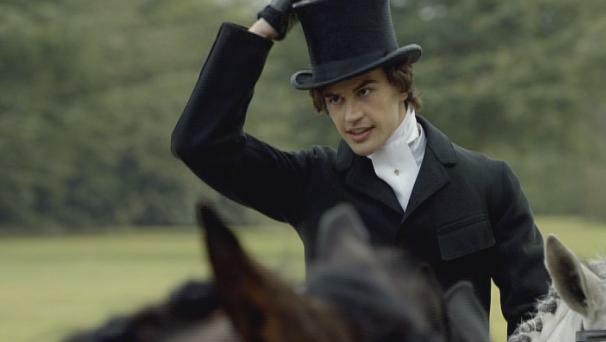 As many as 16 grooms worked in the stables, for no expense was spared in tending to their needs. 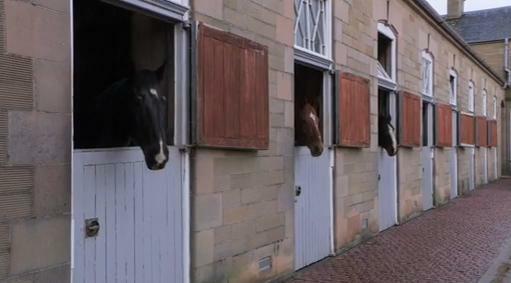 The stables at Manderston House required 16 grooms to feed, care for, and exercise the horses. 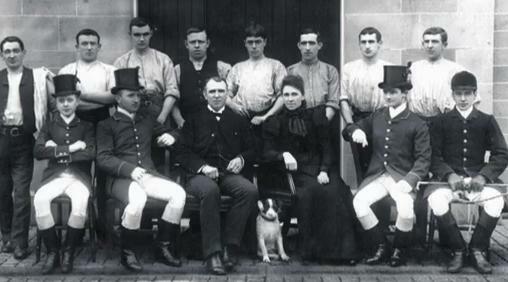 As men and women worked long hours, as much as 17-18 hours per day, the rich during the Edwardian era lived extravagant, indulgent lives of relaxation and pleasure, attending endless rounds of balls, shooting parties, race meetings, and dinner parties. Up to the moment that war was declared, the upper classes lived as if their privileged lives would never change. The Edwardian era marked the last great gasp of manor house living with its opportunities of providing endless pleasure. For the working class and poor, the inequities within the system became more and more apparent. The landed rich possessed over one half of the land. Their power was rooted in owning land, for people who lived on the land paid rent. 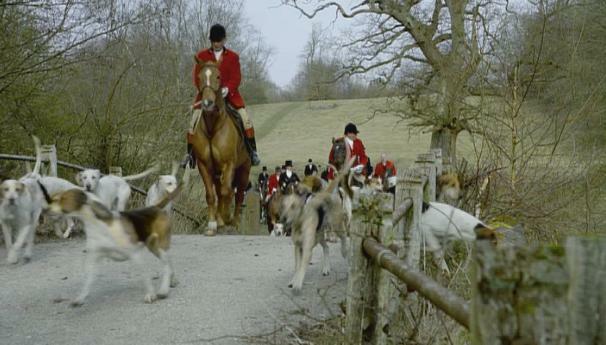 The landed gentry also received income from investments, rich mineral deposits on their land, timber, vegetables grown in their fields, and animals shipped to market. The lord of the manor and his steward can be seen walking among the farm laborers, many of whom were women. The need to keep country estates intact and perpetuate a family’s power was so important that the eldest son inherited everything – the estate, title, all the houses, jewels, furnishings, and art. 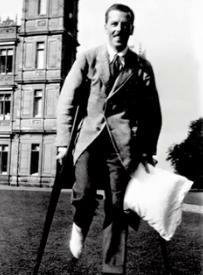 The laws of primogeniture ensured that country estates would not be whittled away over succeeding generations. In order to consolidate power, everything (or as much as possible) was preserved. Entailment, a law that went back to the 13th century, ensured that portions of an estate could not be sold off. The Lord Mayor of London was seated at the center of the table next to the Countesses of Stamford and Lichfield. The system was rigged to favor the rich. 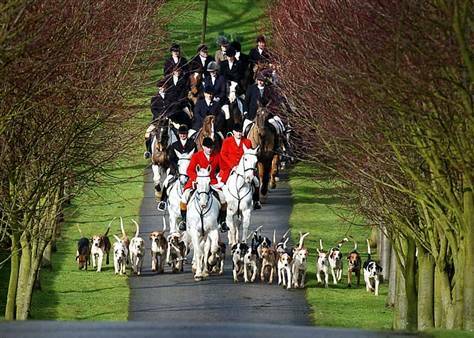 Only men who owned land could vote, and hereditary peers were automatically given a seat in the House of Lords. By inviting powerful guests to their country estates, they could lobby for their special interests across a dinner table, at a shoot, or at a men’s club. 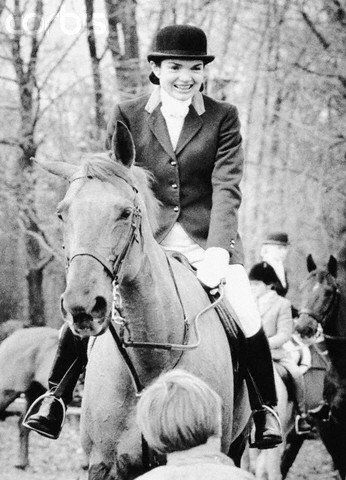 Thoroughbred horses were valued for their breeding and valor, traits that aristocrats identified with. The Industrial Revolution brought about changes in agricultural practices and inventions that presaged the decline of aristocratic wealth. 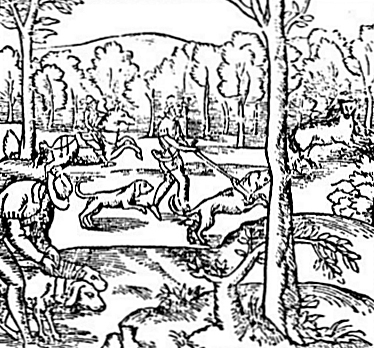 Agricultural revenues, the basis on which landed wealth in the UK was founded, were in decline. Due to better transportation and refrigeration, grain transported from Australia and the U.S. became cheaper to purchase. Individuals were able to build wealth in other ways – as bankers and financiers. While the landed gentry could still tap resources from their lands and expand into the colonies, the empire too began to crumble with the rise of nationalism and nation states. The servant hierarchy echoed the distinctions of class upstairs. The chef worked at the end of the table on the left, while the lowest ranking kitchen maids chopped vegetables at the far right. The kitchen staff worked 17 hours a day and rarely left the kitchen. Contrasted with the opulent life above stairs was an endless life of drudgery below stairs. 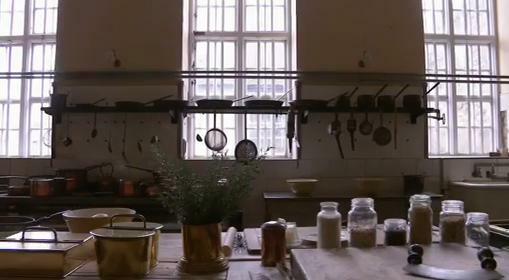 On a large estate that entertained visitors, over 100 meals were prepared daily. Servants rose at dawn and had to stay up until the last guest went to bed. Kitchen maids, who made the equivalent of 28 dollars per year, rarely strayed outside the kitchen. Steep back stairs that servants used. Out of sight/out of mind. One bath required 45 gallons of water, which had to be hauled by hand up steep, narrow stairs. 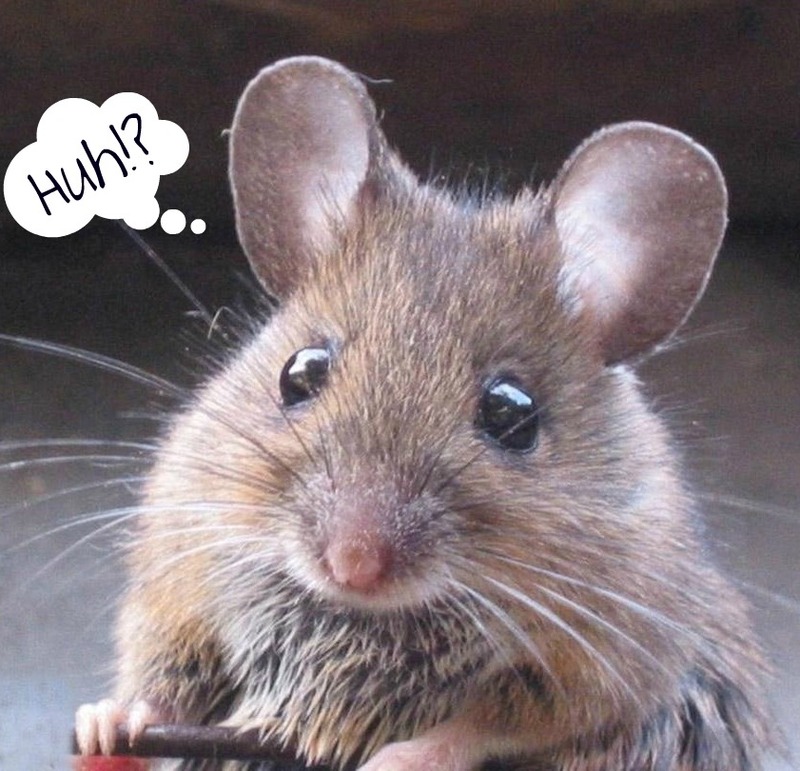 At times, a dozen guests might take baths on the same day. House maids worked quietly and unseen all over the manor house. 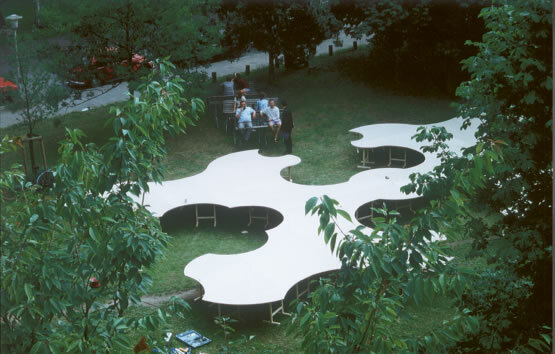 The were expected to move from room to room using their own staircases and corridors. Underground tunnels allowed servants to move unseen crossing courtyards. Maids and footmen lived in their own quarters in the attic or basement. Men were separated from the women and were expected to use different stairs. Discipline was strict. Servants could be dismissed without notice for the most minor infraction. 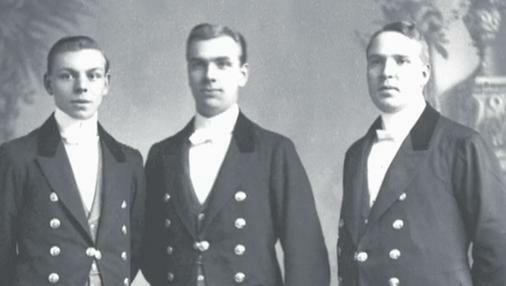 Footmen tended to be young, tall, and good looking. Footmen, whose livery cost more than their yearly salary, were status symbols. Chosen for their height and looks, they were the only servants allowed to assist the butler at dinner table. These men were the only servants allowed upstairs. Green baize doors separated the servants quarters from the master's domain. Green baize doors were special doors that marked the end of the servants quarters and hid the smells of cooking and noises of the servants from the family. The Jerome sisters were (l to r) Jennie, Clara, and Leonie. 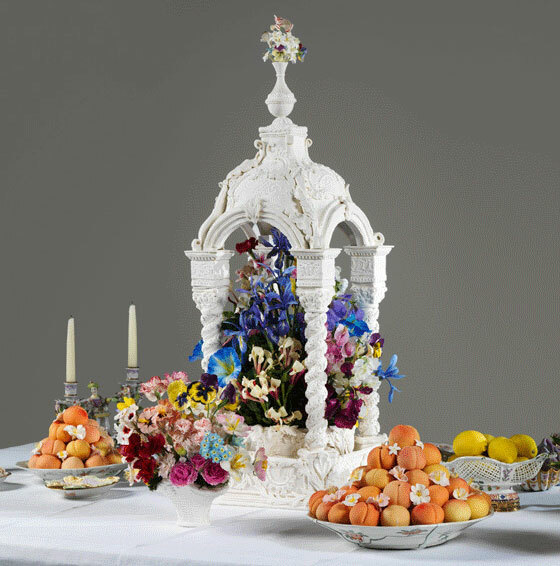 As revenues from agriculture dwindled, the upper classes searched for a new infusion of capital.This they found in the American heiress, whose fathers had built up their wealth from trade and transportation. Free from the laws of primogeniture, these wealthy capitalists distributed their wealth among their children, sharing it equally among sons and daughters. The ‘Buccaneers,’ as early American heiresses were called, infused the British estates with wealth. ‘Cash for titles’ brought 60 million dollars into the British upper class system via 100 transatlantic marriages. Transatlantic passages worked both ways, even as American heiresses crossed over to the U.K., millions of British workers emigrated to America looking for a better life. The sinking of the Titanic, just two years before the outbreak of World War One, underscored the pervasive issue of class. Most likely this lifeboat from the Titanic was filled with upper class women and children. Only 1 in 3 people survived. The different social strata were housed according to rank, and it was hard to ignore that a large percentage of first class women and children survived, while the majority of third and second class passengers died. Labor strikes became common all over the world, including the U.K.
Society changed as the working class became more assertive and went on strikes. The Suffragette movement gained momentum. Prime Minister David Lloyd George was a proponent of reform, even as the aristocracy tried to carry on as before. Lloyd George campaigned for progressive causes. 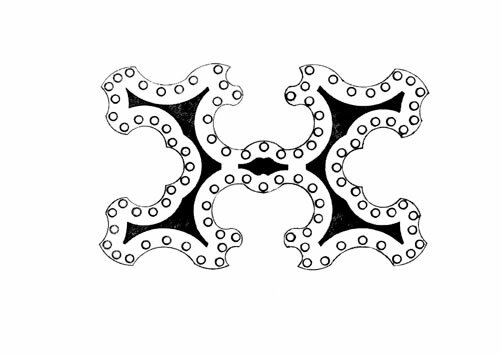 Inventions revolutionized the work place. Electricity, telephones, the type writer, and other labor-saving devices threatened jobs in service. A big house could be run with fewer staff, and by the 1920s a manor house that required 100 servants needed only 30-40. Change is ever present. The last typewriter factory shut its doors in April, 2011. Women who would otherwise have gone into service were lured into secretarial jobs, which had been revolutionized by the telephone and typewriter. 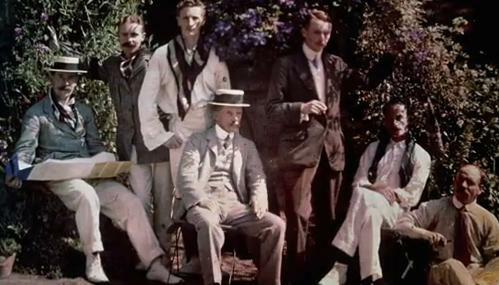 Many of the aristocratic young men in this photo would not return from war. 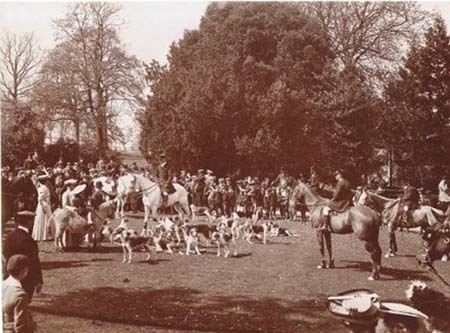 The manor house set enjoyed one last season in the summer of 1914, just before war began. Many of the young men who attended those parties would not return from France. Few expected that this war would last for six months, much less four years. 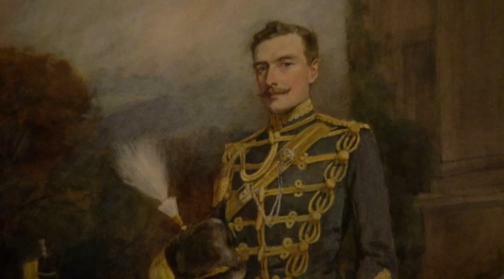 Officers lost their lives by a greater percentage than ordinary soldiers, and the casualty lists were filled with the names of aristocratic men and the upper class. Common soldiers who had died by the millions had been unable to vote. Such inequities did not go unnoticed. Social discontent, noticeable before the war, resulted in reform – the many changes ushered in modern Britain. As the 20th century progressed, owners found it increasingly hard to maintain their manor houses. According to Lost Heritage, over 1,800 have been lost. 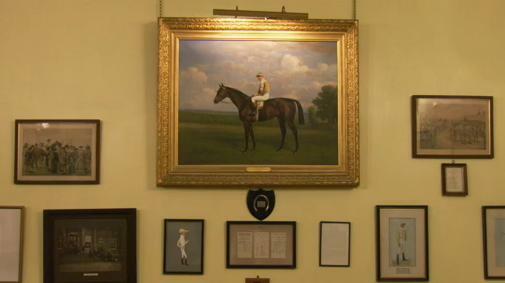 Watch Secrets of the Manor HouseJanuary 22 on PBS. 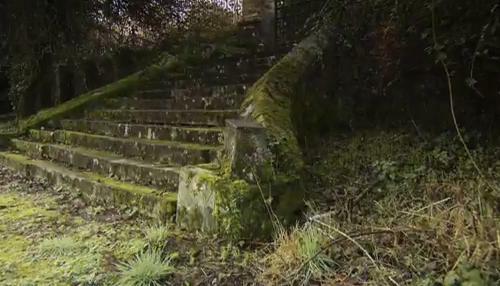 All images from Secrets of the Manor House. 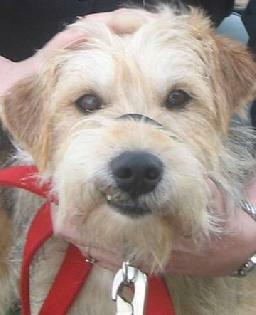 Please note: All advertisements on this blog are placed here by wordpress. I earn no income from my blog. 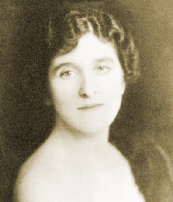 Lady Almina, the Countess of Carnarvon, who lived at Highclere Castle during the turn of the century and through World War 1, had many qualities in common with the fictional Cora, Countes of Grantham in Downton Abbey. Upon Lady Almina’s marriage, her fortune staved off financial ruin for the 5th Earl of Carnarvon and helped to renovate the mansion. 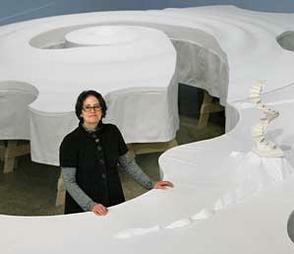 Like Lady Cora, she allowed her house to be turned into a hospital for wounded soldiers, running it at her own expense. On her orders, each wounded officer had the luxury of his own room, with down pillows and linen sheets. She made beds and dressed wounds” (The Daily Mail). 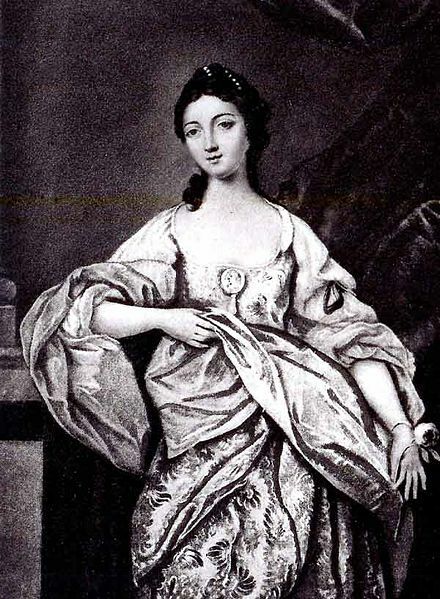 Lady Almina put together a skilled orthopedic operation at Highclere Castle and she had very good nursing skills, so good that she was often sent some of the hardest cases. Soldiers were nursed back to health on fresh linen sheets, propped up on fat down pillows so they could gaze out over a beautiful country park. Silver service dinners were followed by a game of cards in the library while sipping a glass of beer, naturally from the house’s very own brewery. A butler was even on hand to pour the convalescents a nip of whisky before dinner. 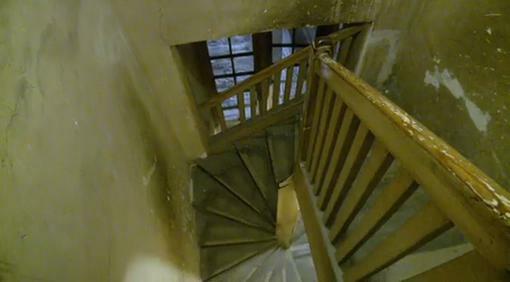 – The Real Downton Abbey: How Highclere Castle Became a World War 1 Hospital (includes a video). “All their young men are gone,” lamented the architect Sir Edwin Lutyens of the sons of Mells Manor, one super-romantic house in Somerset. That was in 1919 when he went to help choose the site of the village war memorial – a figure of St George on a column. The pain of the Horner family at the loss of their son Edward, the last of the male line, can be seen from his monument in the church: a moving statue of the young cavalry officer by Munnings. 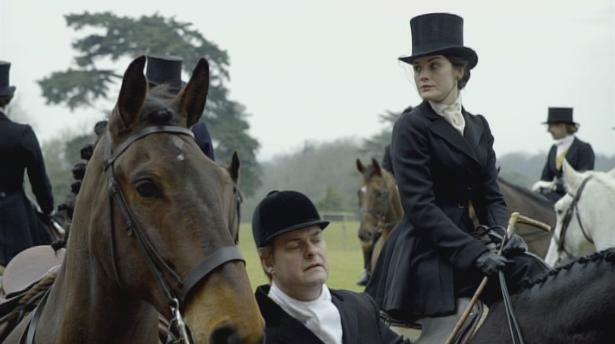 – The Telegraph, What Next For Downton Abbey? For several centuries during wars and conflict, great country houses had been conscripted for medical services. One of the earliest country houses to be used as a hospital was Greenwich Palace, which was converted to a navel hospital in 1694. The numbers of wounded soldiers who were returned from the battlefields of northern France and Belgium were unprecedented. It was enormously difficulty to remove wounded men from battlefields riddled with shell pocks and guarded by staggered rows of barbed wire barriers that were miles long. Scores of soldiers who could have survived under immediate medical attention were left to die unattended. Medics practiced triage, making instant decisions and leaving behind those who stood little chance of surviving or who could not withstand the rigors of being carried to safety. Even when soldiers were successfully brought back to camp, many had to suffer a long wait, for doctors and nurses were overwhelmed, supplies were short, and field hospital conditions were ghastly. A large number died behind the front waiting to be transported. The soldiers who were brought back to England overwhelmed the hospitals and medical staff that were available. Auxiliary hospitals exploded around England, many of them the country homes of aristocrats. These houses were not ideally suited for their new positions. 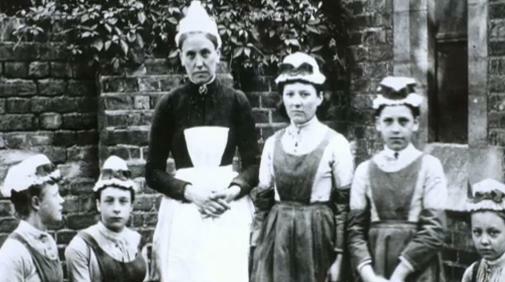 During the late 19th century, Florence Nightingale influenced the design of hospitals, noting the importance of separating unsanitary scullery sinks from patient beds, for example, and improving cleanliness and introducing hygiene. While country houses did not provide antiseptic conditions, they became ideal havens for convalescents and for those who suffered from tuberculosis, for these patients required clean country air. In the second episode of Series 2, the less seriously wounded soldiers or those whose injuries were healing and who needed convalescence were sent to Downton Abbey. In real life, hospitals and convalescent houses were staffed by a commandant in charge, a quartermaster in charge of provisions, a matron in charge of the nursing staff, and the local voluntary aids, who were trained in first aid and home nursing. To accommodate the soldiers, family members were confined and restricted to certain rooms in their own home. One would assume this would not be a hardship, since the houses were so large, but the labor shortage and the need for injured soldiers to be housed in large rooms without going up the stairs would most likely necessitate some appropriation of a family’s favorite rooms. Lord Grantham’s library was divided, so that most of the room became a recreational space and a small section was left to him. 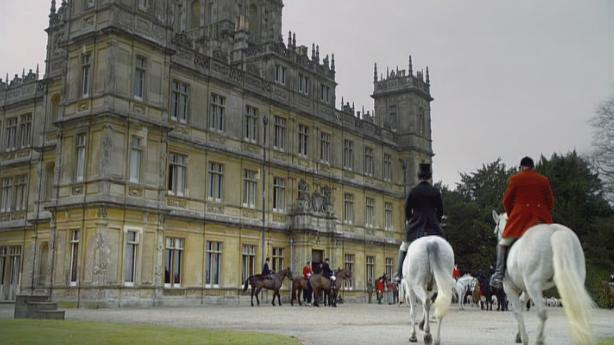 Downton Abbey’s central hall became a dining area. Such changes must have grated on the privileged class, who, while wanting to perform their patriotic duty, could not escape encountering the hoi polloi in their daily routine. With so many men serving as soldiers, servants were stretched thin and forced to perform duties that normally were outside of their scope and that stepped over the boundaries of etiquette. Anna helped to serve at dinner, which would have been totally unacceptable during peace time. Carson, in an effort to maintain the status quo, ruins his health and thus worsens the situation when he is laid low in bed. Due to the war and its many effects, society was in turmoil. Social change happened on many fronts and class barriers began to blur. 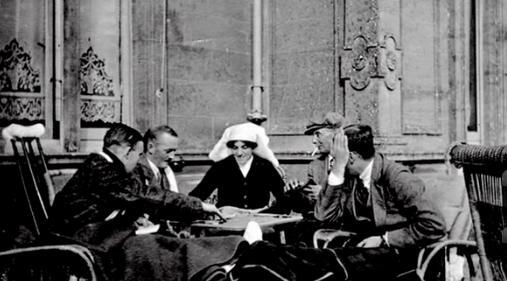 As men fought and died in France, women, including those who formerly worked as servants, filled their positions in factories, corporations, and farms. Great houses began to feel the pinch of being short staffed, and genteel ladies who were accustomed to being served had to cook and sew for themselves. It was only because of the war that a former footman like Thomas would dare enter through the front door or that a doctor could serve as head of the hospital and make decisions that overrode those of the owners of the house. Lady Sybil, whose support of the suffragettes was revealed in the first series, became a VAD (Voluntary Aid Detachment Nurse), for there simply weren’t enough professional nurses to go around. 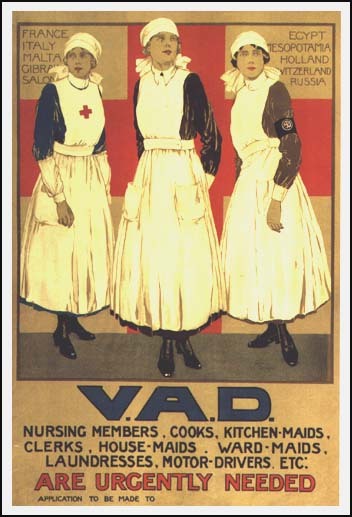 VADs were trained for only a few weeks before working under professional nurses. 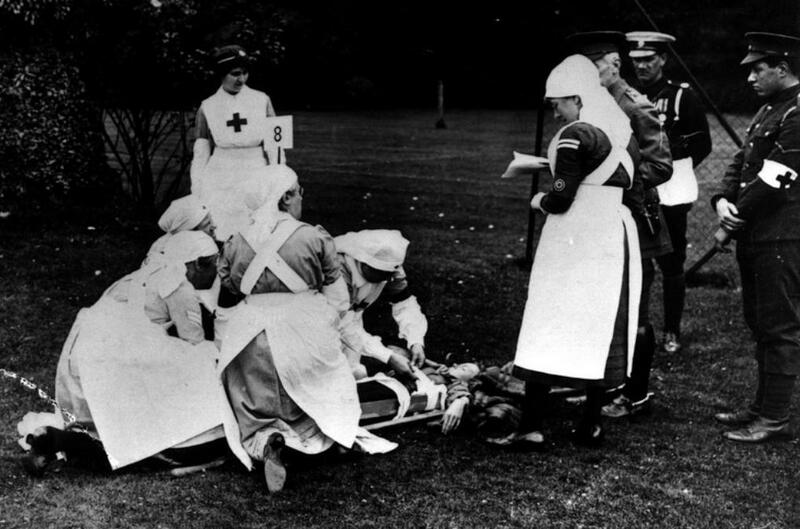 VADs changed linens, sterilized equipment, and served meals, but many were also exposed to the rawer side of war and at times, when the influx of casualties overwhelmed the staff, VADs were expected to perform the duties of a professional nurse. Serving as a VAD changes Lady Sybil, giving her a direction and purpose. Lady Edith, too, finds new meaning in an otherwise predictable life consisting of dinners, parties, and long stretches of boredom. 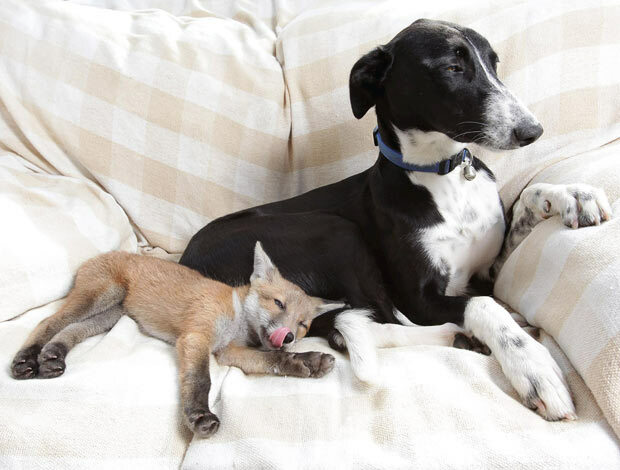 Lady Sybil advised her sister to find her talent and pursue it, which Edith did. 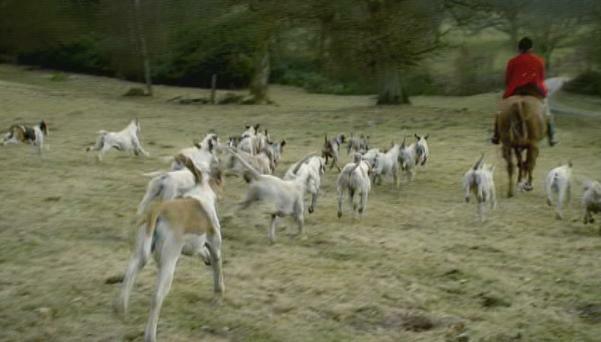 One wonders if Lady Mary will find a similar passion before she throws her life away and marries a man she does not love or (we suspect) respects. The strength of Downton Abbey’s plot threads this year is how they incorporate the roiling changes in class structure during a complex political time in which the necessities of war, the dissatisfaction of the working classes, and the continued growth of the women’s movement influenced the lives of the series’ characters. More on this topic later. 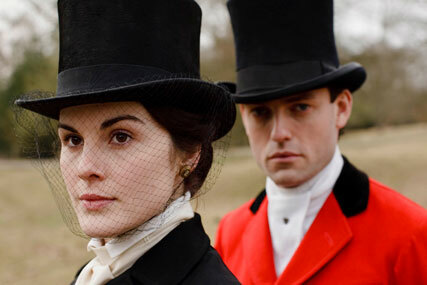 Please note: You can watch Downton Abbey Season 1 on Netflix as a DVD or streaming. *To End All Wars: A Story of Loyalty and Rebellion 1915-1918, Adam Hoschschild, Houghton Miflin Harcourt, New York, 2011. Telegraph: What’s next for Downton Abbey? 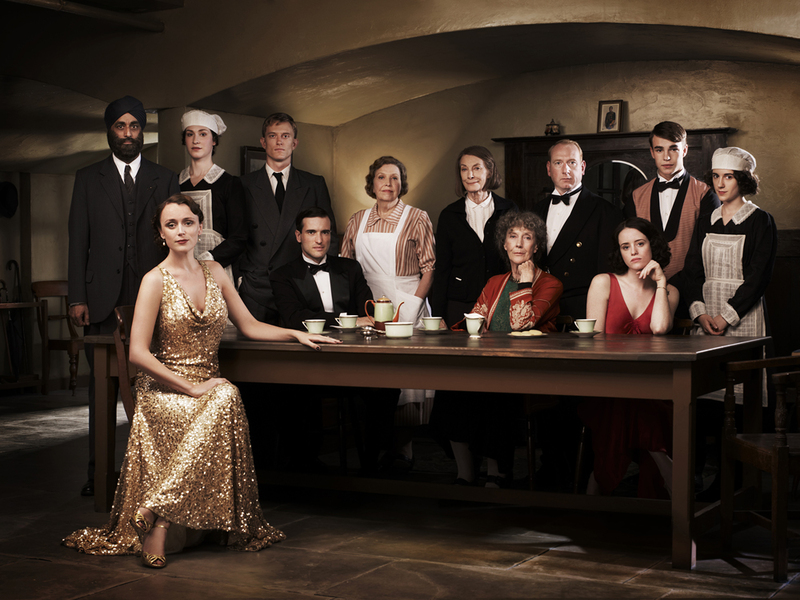 The third episode of Upstairs Downstairs will be shown this Sunday. Will you tune in? (Watch all three episodes from April 25 through May 24 at this link.) Better yet, the BBC will make the DVD available for sale Tuesday, April 26th. BBC’s Upstairs Downstairs DVD is available for purchase! Upstairs Downstairs has been brought back with a fresh new cast. It is 1936 and six years since parlormaid Rose (Jean Marsh) left 165 Eaton Place. Fate brings her back to the house and its new owners, Sir Hallam Holland (Ed Stoppard), his wife Lady Agnes (Keeley Hawes), and his mother, Lady Maud Holland (Eileen Atkins). Rose recruits a new “downstairs” family to help run the elegance and finery of the “upstairs” world. Set against the historical backdrop of a pre-World War II Britain with a new King on the throne, with Fascism on the rise on the continent, and with sexual, social and political tensions at 165 Eaton Place, this new series provides an evocative take on the master-servant relationship. CONTEST is CLOSED. The winner is Felicia!! : For an opportunity to win the DVD, all you need to do is leave a comment stating what you liked best about this 2010 series! The drawing (by random number) will be held on Tuesday, April 26th at 11:59 PM, EST.